I wasn’t the biggest X-Men collector as a kid, which is odd considering that mutants were the biggest thing in comic books in the early 1990’s. I always preferred Superman, Batman, Spider-Man and the Hulk. However, I loved the cartoon show, who didn’t? I also really liked Wolverine and even owned the original miniseries by Chris Claremont and Frank Miller but Claremont was off X-Men by the time began collecting my own comics. This X-Men book featured the Gold team of X-Men. At the time there were two teams of X-Men, Blue and Gold. Blue was headed by Cyclops and Storm was the leader of the Gold Team. Currently, Marvel is running an X-Men '92 series revisiting the team from animated series but let's see what was going on with the X-Men in '92. Colossus answers the door to the mansion and discovers an old flame, Callisto, badly injured and needing his help. The layout of this page could use some work. The X-Men assemble and Callisto says that the Morlocks attacked her and that saving the healer is more important than saving her. Bishop heads out the back to discover the Healer lying in the grass. Bishop is always posing with a gun at this time. Why don't the black borders go around the entire page? In the medical room, we learn all the details of Callisto’s run-in with the Morlocks, the group she used to lead. Mikhail interrupts the explanation to tell the Professor he’s overreacting. Jean Grey wants to know how he got into the psionic loop and Mikhail’s mystery deepens. Mikhail is the definition of an annoying houseguest. As they leave the room Storm accepts responsibility as leader of the Morlocks, causing Archangel to flip out on her saying that he’s the result of her leadership. His face looks like the teacher from Daria. Meanwhile, the Healer creeps in and heals Callisto, but only had enough energy to return her to her Morlock state. Suddenly, she looks like an after-meth picture. Interlude: a Brian Bosworth-looking guy visits a man strapped into a chair in a nursing home. He remarks to the nurse that he doesn’t look like humanity’s last hope. Then we don’t see them again for the rest of the issue. I wanted to just give the panel, but I couldn't scan without cutting something off. The X-Men travel into the subways to talk to the Morlocks, entering their headquarters through a psionic projection of a pile of bodies. By the White Wolf, indeed. 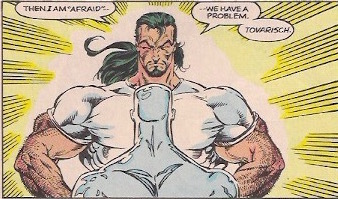 Meanwhile, Iceman, who was left in charge of guarding the Callisto and is confronted by Mikhail. Mikhail's ponytail acts as a wind vane. Can anyone find me either the Hulk or Death's Head shirts? Not really, this book seems to be every 90s cliche in one. The plot is convoluted, it requires multiple editors notes to get the back story. My favorite one didn’t even cite a back issue but just said to believe us. The book wasn’t written in a way to allow for new readers. It makes the book a bad starting point for the series and breaks Stan Lee’s mandate to treat every comic like it’s someone’s first. Warren is pissed off this entire book. The art left a lot to be desired. This is at the height of Liefeld-mania and his influence is all over this book. The art didn’t so any action but more looked like 22 pages of covers. Everyone’s posing all the time, you never get any sense of motion in the art. There’s covered feet, (because they”re hard to draw) people not looking like they’re walking but that they’re floating just above the ground, weightless. What’s interesting is that as a kid I thought that the art was amazing, we’d all try to draw in this style when we’d have art in school, but now it doesn’t hold up. It looks amateur. Don’t bother to pick this book up unless you’re buying it ironically for the 90s cliches. We switch Marvel Teams and check out the Avengers in Avengers #38 by Kurt Busiek and Alan Davis! See you next week! In the original version of this blog, I wrote that Callisto was also known as Masque. It was pointed out to me by reddit user Hellsion, that she wasn't. I misread the dialogue. Colossus says she was a victim of Masque. Whoops.